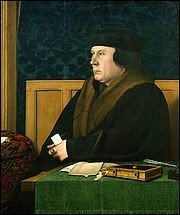 King Henry VIII's adviser Thomas Cromwell has long been one of history's villains. Wolf Hall reconsiders the verdict. This densely packed, long and witty novel, portrays him as a man of intellect, daring, practicality, ambition, humor and – here's the surprise – kindness and affection. It works. The portrait is psychologically rich and well supported with historical detail. Cromwell, a commoner's son, made himself indispensable as an aide to the wily and powerful Cardinal Wolsey during the first part of Henry's reign. Weathering Wolsey's downfall, he then succeeded where Wolsey had failed in constructing a route for Henry to set aside Katherine of Aragon and crown Anne Boleyn as his queen. The central conflict in Wolf Hall is between Cromwell and Thomas More. More, beheaded in 1535 for refusing to swear an oath to defend the right of Anne's children to succeed to the throne over Katherine's daughter, was canonized as a Catholic martyr four hundred years later. Since then, the struggle between More and Cromwell has been portrayed as a clash between a courageous saint and his evil persecutor. More's admirers have glossed over his crusade against Protestantism, which led to the torture and burning of men who distributed Tyndale's English New Testament. Wolf Hall brings this back into the open, a reminder that religious steadfastness is not necessarily a virtue or flexibility the Mark of Evil. Wolf Hall is #1 on my "Best Historical Novels I Read in 2009" list. Dissolution by C.J. Sansom (2003), #1 in the Matthew Shardlake mystery series featuring a sleuth who works for Thomas Cromwell and set during the dissolution of the monasteries, several years after the close of Wolf Hall. Review or More info at Powell's Books. Readers may also be interested in Prince of Darkness, an excellent article about Cromwell by C.J. Sansom. A Man for All Seasons , the influential 1966 movie starring Paul Scofield (based on Robert Bolt's play) has defined the Cromwell-More conflict for four decades. A surprise box-office hit, it collected six Academy Awards, including Best Picture. In contrast to other acclaimed historical films of the 1960s, such as The Lion in Winter and Becket , it now seems dated with its stagy, almost caricatured portrayals of More, Cromwell and Henry VIII. Viewing it in conjunction with reading Wolf Hall makes the novel all the more convincing.